81 pages of beautiful color photos of the film, outstanding black & white photos of the making of the film, sketches of the production designs, sketches of the super weapons and interviews with the cast and crew (all in Japanese). Included are photos of early Godzilla films and a breakdown of each movie along with a picture of the posters for the movies. 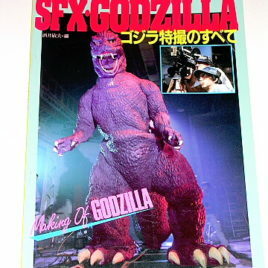 This is an awesome book, we especially like the detailed photos of the making of Godzilla X Megaguirus 81 pages of beautiful color photos of the film, outstanding black & white photos of the making of the film, sketches of the production designs, sketches of the super weapons and interviews with the cast and crew (all in Japanese). Book dimensions 11 1/2 inches by 8 inches. THIS IS A FANTASTIC BOOK by a master of special effects who has passed on. We are sad that that the world has lost a creative filmaker and businessman and a true gentleman Kawakita-san. We obtained the advance copies of this book by attending the Heisei Godzilla Movie Festival running in November 2009 in Tokyo. On each Saturday of the month not only was a movie shown but there was a pre-screening a talk with some of the people involved in the movie production. The book was officially released on November 30th 2009. Kawakita, Koichi is the editor/author of the book and the most recent special effects master of Toho Films. The title is Heisei Godzilla Chronicle; 55 years a star; 20th annniversary. It covers what are known as the Heisei period Godzilla Movies: Godzilla vs Biollante, Godzilla vs King Ghidora, Godzilla vs Mothra, Godzilla vs Mechagodzilla, Godzilla vs Space Godzilla and Godzilla vs Destroyer. Each movie is given a separate section which is broken down by the weekly production schedule. There are many behind the scenes and action shots! The photos are from Kawakita's personal collection. Each movie has extensive artist's concept sketches of all the monsters and vehicles. There is the full story board from Godzilla vs Biollante. There are biographies and photos of all the production staff including directors, cinematographers, suit makers, prop makers, model makers-everyone who was involved in the special effects or behind the camera production. There is so much in this book we can't cover it all.The book has 271 pages; soft back book dimensions 8 1/2 by 12 inches. 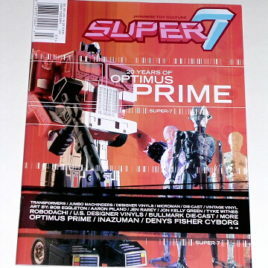 This is the 3rd issue of Super 7 Magazine. It features articles on 20 year of Optimus Prime, Bullmark Die-cast toys and Vintage Vinyl figures. This issue has amazing artwork and color photos.This is a wonderful magazine if you love Japanese Toy Culture. This is also a great reference book for collectors! Limited supply available. Magazine dimensions 11 by 8 1/2 inches. NOW RARE and OUT OF PRINT!